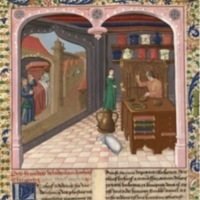 An illumination from 1240 found in Batholomeus Anglicus's book On the Properties of Things. It depicts, among other things, a medical practitioner examining a urinal for his sick patient. 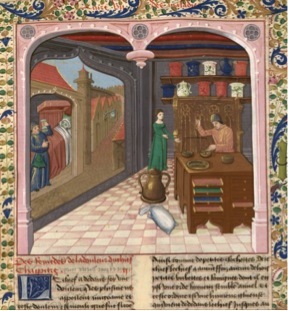 “Doctor with a Urinal (from an MS in the Bibliothèque nationale de France),” Medieval London, accessed April 22, 2019, http://medievallondon.ace.fordham.edu/items/show/43.